Our latest show featured the overdue second part of our exclusive interview with Albert Hammond Jr of The Strokes. This entry was posted in Bradford Beat and tagged albert hammond jr, the strokes on March 16, 2018 by Simon. There was no Bradford Beat this week because of our special International Women’s Day broadcasts. And the previous week we were snowed off! But do not fear – we’ll be back on Thursday 15 March with the second part of our interview with Albert Hammond Jr. This entry was posted in Bradford Beat and tagged albert hammond jr on March 10, 2018 by Simon. Listen again to the first part of our exclusive interview with Strokes guitarist Albert Hammond Jr in which he talks about his new solo album Francis Trouble, inspired by his feelings about his stillborn twin. 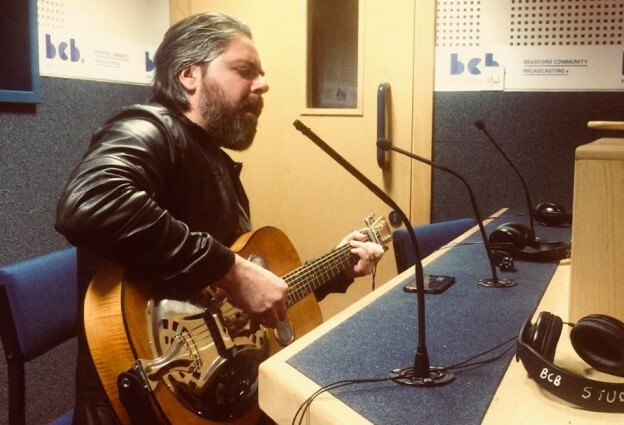 Singer-songwriter Wilson was also a studio guest and played three live acoustic tracks for us as a taster for his forthcoming second album. This entry was posted in Bradford Beat and tagged albert hammond jr, strokes, the strokes, wilson on February 23, 2018 by Simon. There are two treats in store for you tonight (Thursday 22 February) on Bradford Beat. We have Leeds-based singer-songwriter Wilson in the studio chatting about his music and playing three live session tracks. And there’s also the first part of our exclusive interview with Strokes guitarist Albert Hammnd Jr.
Bradford Beat in on BCB 106.6 FM from 8pm to 9pm. This entry was posted in Bradford Beat and tagged albert hammond jr, strokes, the strokes, wilson on February 22, 2018 by Simon.